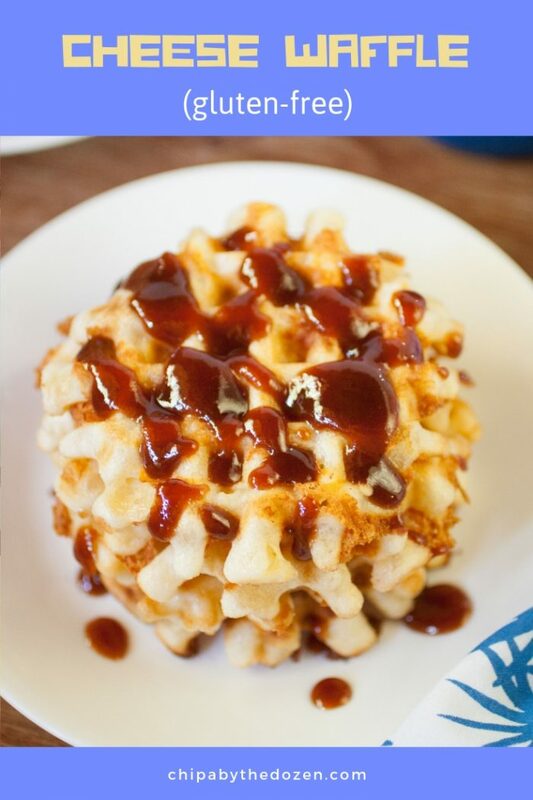 Crispy, chewy, cheesy waffles made with cassava flour which is naturally gluten-free. If you’ve been browsing around this blog, you’ve seen lots of recipes made with cassava root, or cassava flour. Cassava is a root with a thick, brown skin. Inside has a white fibrous white flesh. Cassava is grown all over South America and is consumed almost daily in many countries. If you want to know more about cassava and its uses, check out this article I wrote a few weeks ago: WHAT IS CASSAVA AND HOW IS IT USED? The batter for this recipe has the same ingredients as chipa licuadora (you might want to check this recipe), but in different amounts. This recipe has very few ingredients. 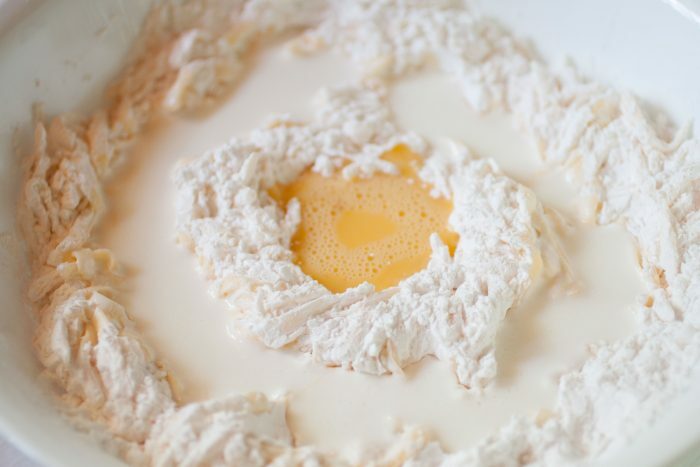 Cassava flour, cheese, eggs, milk and oil. 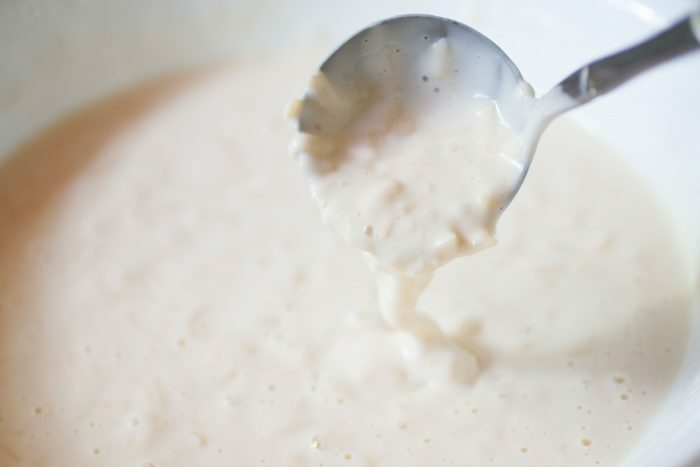 The ingredients for chipa licuadora are mixed in a blender, making the batter very smooth. I wanted to see the little pieces of cheese, so I mixed everything in one bowl. So the batter looks like the one for chipa licuadora. But the flavor is more like cuñapé. A very popular South American dessert is a slice of cheese, spread with a layer of guava jam. 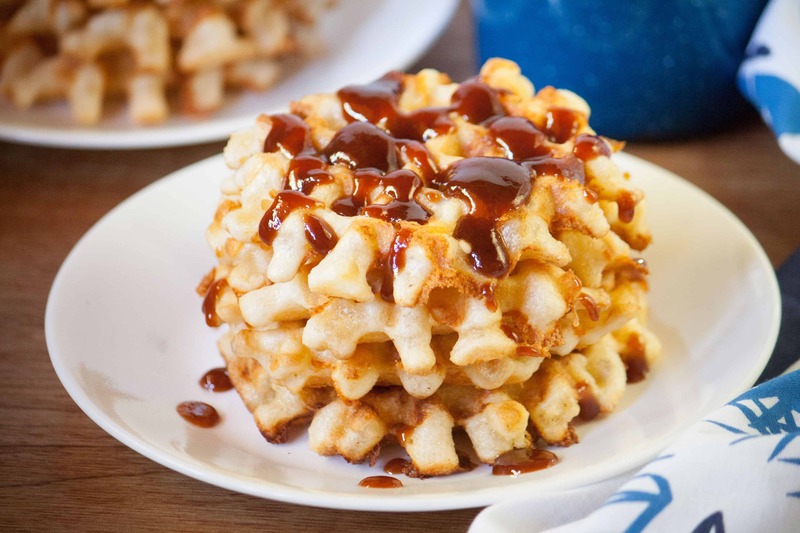 That sweet – savory combo is my favorite way to serve these cheesy waffles. Honey. I love honey, and it goes well with cheese. 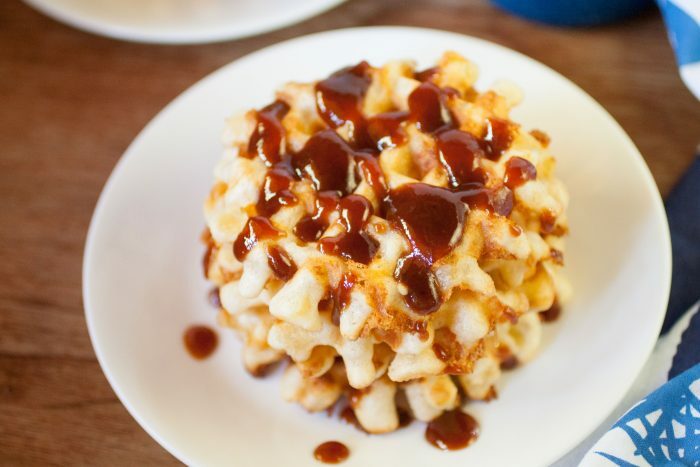 Pizza sauce goes amazingly well with these waffles. How would you serve these waffles? In a large bowl, add all the ingredients and mix well with a spoon. Grease waffle maker with oil or butter and add 2 tablespoons of batter into each square. Close waffle maker and cook for 4 minutes. Remove and repeat until all batter is finished. If desired, serve with guava jam or honey. 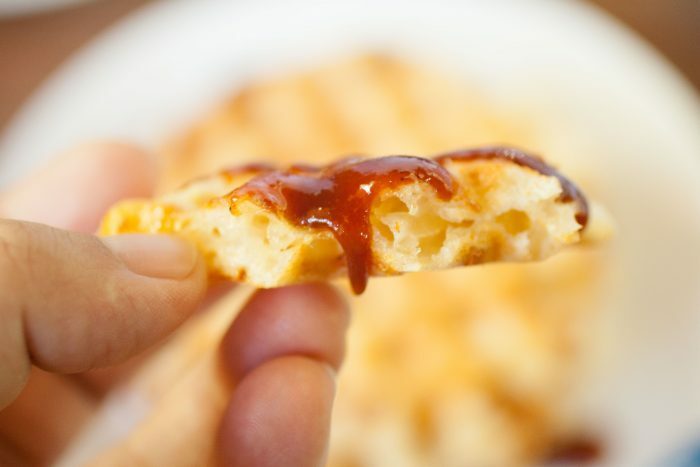 These cheese waffles can be served with a little honey, guava jam or pizza sauce. I hope you can find cassava starch/flour and make them. Let us know how they turn out. So I’m thinking I’m going to give these a try this weekend. No baking powder or soda needed? And sour milk is the same as buttermilk, right?! You are right. No baking powder or soda. To make sour milk, just add one tablespoon of vinegar or lemon juice to a cup of milk, and let it sit for 5 minutes. We don’t have buttermilk here, but I think you can replace it for sour milk. I hope you like them! YUM! Love the sound of these GF waffles, Lizet. They’re really making me hungry right now! I love waffles and I love that cheesy bread and then the guava?!! I would be in heaven!! Thanks for linking up to us at Fiesta Friday! 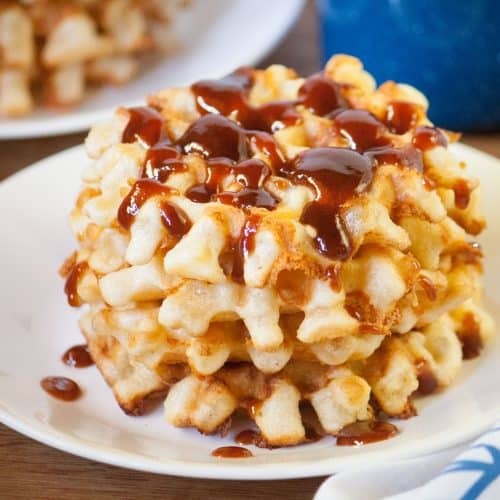 OMG I simply love the idea of cheese waffles! Great photographs as well. Anything involving chadder is definitely a big YES to me. I never imagine I could make cheddar waffles. This is a something really new to me. I must give this recipe a try. Looks and sounds absolutely amazing. I’m sure you’ll like it Natalie! Oh my. So much cheese and waffle goodness!! I have an ancient waffle iron, but it still works. I’ll be pulling it out this weekend to try these. I like the suggestion about serving these with honey. I imagine the sweet and savory combination is EXCELLENT! 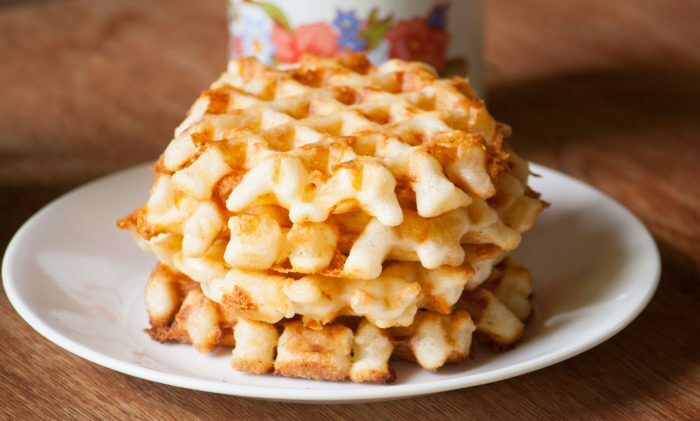 These waffles look so cheesy and delicious! I love the idea of serving them with pizza sauce. Thanks for sharing!